Stickers from Mrs. Grossman’s Sticker Club ship straight from their California factory to you! 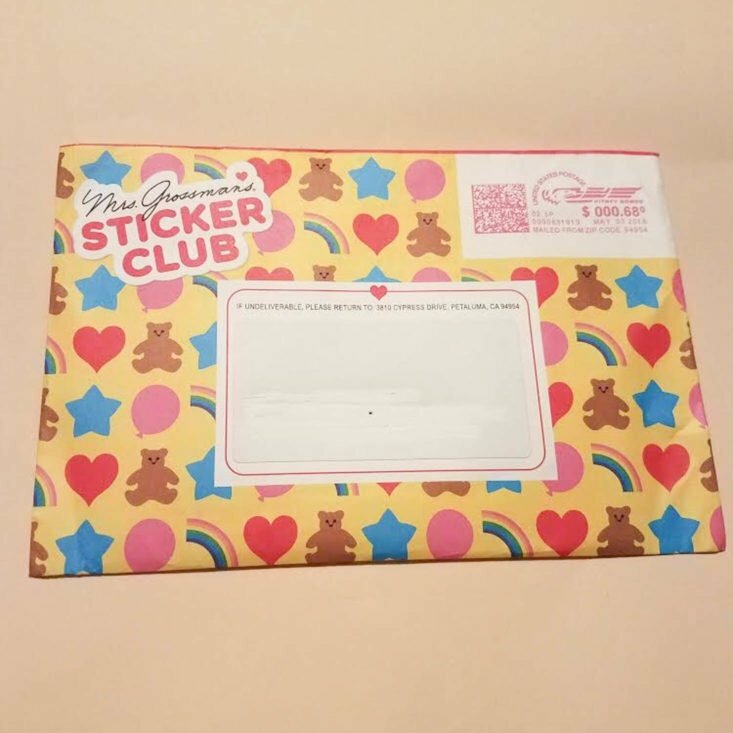 They send you a super special package every month that includes 15+ sheets of stickers, a sticker from their special vault, reusable packaging they use from recycled paper, and exclusive perks just for club members! COUPON: Use code MSA5 to save $5 off your first box! Good to know: Shipments are sent via USPS First Class around the 4th of each month. Subscriptions renew automatically and can be canceled at any time. Here is the intro letter that comes with every package telling you what’s inside your sticker bundle. This letter informs you of the month, theme, and a description of the special vault stickers. Don’t throw this letter away because it also includes special codes and perks to club members. Here is the adorable signature bear postcard that comes each month! There is also another $5 code on the back! First thing first, every month there is a tiny gold envelope with a mini surprise. Let’s see what’s inside this month! Inside I found a small sticker sheet with three different sized gifts from 1990 and 1993. These are collectors items from the Mrs. Grossman’s Sticker Club archives. One small square shaped gift, one longer rectangle sized gift and then a pretty cool round sized gift all retro and topped with pretty bows on top of them. The colors are bright neon and super fun to collect. These puffy brown bear stickers are simply too cute for words! I love how all six of them are different from each other. Four of the bears are holding fun summer treats while the other two bears are just hanging out. One with funny eyeglasses and mustache while the other is rocking out to tunes with his boombox. The backdrop teal colored card has golden hearts and Mrs. Grossman’s signature at the very bottom. The first two sheets are of cakes and candles. You can’t have a birthday party without cake and candles. One sheet has half inch birthday cakes that are covered with white and chocolate frosting each topped with five candles each. All five candles have a different fun design on them. The next sheet has 20 flamed polka dot & striped candles, and each of them is decorated in different patterns and colors. The next two sticker sheets are full of colorful balloons, because every party has balloons right? These balloons are new to Mrs.Grossman’s Sticker Club. One sheet has four large colorful balloons that are perfect for any type of celebration, and the confetti on the side gives them the perfect “pop” of gold! The other sheet has 20 smaller foil glitter balloons in the colors red, blue, purple, yellow and pink. These two sheets are perfect for decorating any birthday card you may be giving the birthday boy or girl. The first sheet has two “Happy Birthday” stickers that are spelled out in fun colorful blocks. The next sheet has pretty cool glitter foiled curly ribbons surrounded by confetti. The colors are intertwined together making them super fun to look at. This sticker sheet has the word party at the very top spelled out in different color letters. Under the word “PARTY” is an array of cool birthday themed stickers like cupcakes, party hats, balloons, cake, candles, gifts, a windmill and of course a colorful pinata! You have everything you need on this sheet to decorate a fun birthday card. My next two sticker sheets are full of fun colorful stars. One sheet has 80 tiny stars all different colors of the rainbow, which can be used for just about any occasion. The next sheet has six gold shooting stars with a rainbow shadow behind them. Then there are 12 gold stars that are two different sizes. Between these two sheets, you have enough stars to last you a while. These special stars are also new to the Mrs. Grossman’s Sticker Club collection! While we’re on the subject of stars, the next two sheets are full of fun foil glitter stickers. The first has four medium-sized gumball machines full of colorful gumballs inside and out. Next to the gumball machines are separate little stickers of gumballs and the money you will need to get them! The next sheet of stickers has 40 silver hologram stars all the same size. These stars are so fun to look at, if you move the sheet around you can see all the fun holographic colors! This next single sheet of stickers is also a glitter foil combo of fun colors. It is full of very different crowns for that special boy or girl. There are nine different glitter sparkly crown patterns that any kid would love. These special crowns change colors as the lights hit them, how fun is that? The next two sticker sheets are full sheets. This first one is of the alphabet in sparkly fun colors that can be used to spell out someone’s name or decorate a fun party tag to go along with your gift! The second sticker sheet is these cool watercolor cupcake stickers. There are four different ones. One with blue frosting, green frosting with yellow sprinkles and a cherry on top, one with orange frosting with blue sprinkles and a cherry on top and the last one is a cool mixture of rainbow colored frosting. You get 20 pastel colored cupcakes that would make perfect seals for a birthday invitation. I saved this single sticker sheet for last because it’s my favorite out of all the single sheets. I am a huge dog lover and I just love how they included these realistic looking party dogs to join the birthday festivities. There are four stickers of three adorable looking party animals. There is a black one on one end, a white dog in the middle and a gold pup on the end. They all have their mouths open with birthday hats as if they are barking along to the happy birthday song! I’m in love with these! Verdict: This was my very first month receiving stickers from Mrs. Grossman’s Sticker Club and for a first impression, I am very pleased with the wide selection of creative stickers. For $12.95 including free US shipping, you will receive a sticker package like this one every single month. If you happen to see any particular stickers that you like in this review, you’re in luck because the majority of these sticker sheets are available to purchase separately in their shop. They have many different themes, styles, and super cute designs. They also sell other items separately from metallic stickers, soft puffies, activity books and even sticker kaleidoscopes! If you happen to be an avid sticker collector, plan on your collection growing very quickly with this sticker club. It’s amazing how many different stickers you get per theme for such a reasonable price. Mrs. Grossman’s Sticker Club is an awesome club to be in! Subscribe before June 25th at 4 PM PST to get our next sticker pack in July! We’ll ship orders to Mrs. Grossman’s Sticker Club members on the 5h of July. Coupon – Use code MSA5 to save $5 off your first box! Value Breakdown: This box costs $12.95 + free US shipping, which means that each of the 17 sticker sheets in the box has an average cost of $0.76. 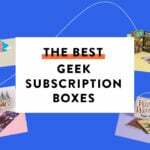 Check out more sticker subscription boxes in the DIY + Craft Subscription Box List! What do you think of Mrs. Grossman’s Sticker Club? I am addicted to subscription boxes for so many reasons. For one I simply love the element of surprise that each month brings, whether its beauty, skin care or anything else. I love the opportunity of trying out new products every month without having to commit to the full purchase. My favorite boxes are Boxycharm, Popsugar, and any Mommy and baby boxes. I am a brand new mother and I love trying out new things for my baby and I love how they always have something special for mommy! Does Mrs. Grossman’s Sticker Club issue spoilers? I’m curious about July. 37 no kids and I sub for stickers lol. I got the inaugural pack from them and i love grossman’s art but found the heart theme overwhelming. I’m single and it was pounded home with that pack lol. I would have loved this one because its birthday season in my family. I also love holo stickers. I’m thinking I’ll cancel violette and resub with Mrs. G. I love violette but can’t stand the old Victorian children or humanized animal stickers any longer. I love stickers, but I think these are really frumpy and dated-looking. The glitter comic sans letters, yikes! Ugh, I know. I don’t even find their storage system useful, sad that that’s what broke the system. I agree… I actually had some of these sheets as a kid when my mom tried to get me into scrapbooking [late 90s]. I definitely prefer the more modern look of Stickii and other boxes that look like an artist actually designed them. The June package is even better! This is a great sub. I don’t do paper crafting, but these stickers are my reward for exercising, and I stick them all over my workout journal. Um, I’m 44 years old. Yup. Love this sub. A great value! The postcard every month is a fun bonus. This is a childhood dream come true!! Oh, wow! I am a nearly 40 year old woman with no children (so probably NOT the target audience for this at all, LOL), but I think I’m going to have to subscribe! I LOVED Mrs. Grossman’s stickers as a kid and these are just as fun as I remember. I’ve been meaning to get better organized and start using a planner and these could be a fun addition to that. Thanks! Forty-four and child-free here. DO IT!!!!!! This is such a fun sub. 46 and I grew up on Mrs. Grossmman’s stickers (no kids either). I am so glad you reviewed this sub! I am definitely going to get this!